An absolutely brilliant duet session from Giovanni Di Domenico and Akira Sakata! While yes, a good majority of Iruman is improvised, the two musician smoothly create a beautiful soundscape that this lush and romantic. And its stands out more than its improvised parts. "Yellow Sand Blowing From China" and "Lotus Blossom In A Old Pond," are both deeply involved numbers but the intricately place notes by Di Domenico set a romantic path for listener. This run tangent to Sakata's sprawling lines and once blended together become bold and outrageous statements of adventure. On the fresh and rampant "Bud I," the duo show a marvelous combination of notes. This piece felt reminiscent of Ornette Coleman with Sakata running up the scales at full-blast. Di Domenico following with great agility. 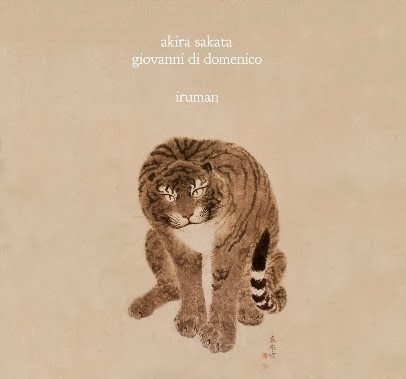 "Papiruma," is more a spiritual outing between Sakata utilizing his improvised vocals along side Di Domenico's arpeggios on the keys. Exciting and challenging movements and worth treasuring. Throughout Iruman you get a sense of a solid understanding between the two musicians; in addition to a edict to find other spaces for their lyrics to go. This is a daring yet pleasing session that flows nicely in free form as well as in an uplifting and emotional atmosphere. Highly Recommended.